This dog dig collar prevents dogs from digging in unwanted areas. 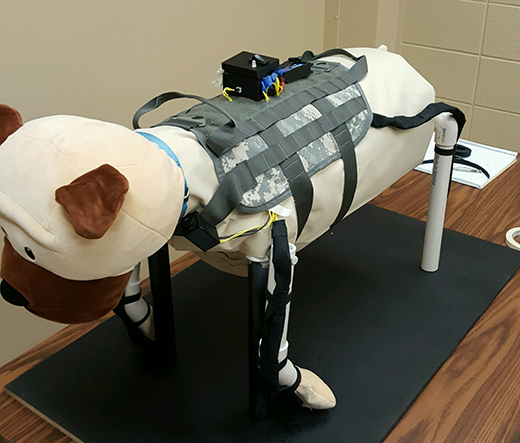 It is one of the undergraduate student projects that will be on display at the Kansas State University electrical and computer engineering department's Senior Design Expo from 1:30 p.m. to 4 p.m. on Tuesday, Dec. 4. Think of it as a mini Consumer Electronics Show. During the Tuesday, Dec. 4, Senior Design Expo, 26 Kansas State University undergraduate electrical and computer engineering students will display and demonstrate their electronics projects. The expo will include projects such as a motorized fitness ladder, a dog dig collar and an inventory tracking system. The Senior Design Expo will be from 1:30 p.m. to 4 p.m. in the atrium of Engineering Hall. The event is free and open to the public. The expo is the culmination of a two-semester capstone course and also involves industry partners. • A tracking system to help companies determine inventory. • A quality inspector for airplane rivets. • A motorized fitness ladder. • An electronic braille system. • A collar that prevents dogs from digging in unwanted areas. "Our department is excited to host this first expo of our outstanding seniors and their projects, and we appreciate the leadership of Sungo Kim," said Don Gruenbacher, George J. and Alice D. Fiedler distinguished chair in electrical and computer engineering and instructor for the course. It is the first year the department has conducted the Senior Design Expo, which is part of the new Industry-Academia Partnership Program in the electrical and computer engineering department. The program involves project-based learning that partners electrical and computer engineering undergraduate students with companies. Students spend a year collaborating with an industry partner, learning more about the company and designing a proof-of-concept product that addresses the company's needs. In turn, industry partners can recruit students through internships and potential employment opportunities. Ardent Mills is the program’s first industry partner and leaders in the electrical and computer engineering department are actively recruiting other industry sponsors. "The Industry-Academia Partnership Program will provide a strong pipeline and new way between student job opportunity and industrial recruitment using industry-led projects," said Sungo Kim, associate professor of electrical and computer engineering and Michelle Munson-Serban Simu Keystone research faculty scholar. Elijah Simmons, Burlington; Brian Gerwick, Derby; Trevor Unruh, Galva. From Greater Kansas City: Hannah Baldwin and Jack Maatsch, both from Kansas City, Missouri; and John Laughlin, Matt Legler and Luke Zahner, all from Overland Park. Shelby Coen and Henry Hickert, both from Hutchinson; Gaige Jacobus, Oakley; Amber Schubert, Salina; Miranda Dodson, Topeka; and William Lies, Wichita. From out of state: Corey Gaither, Valparaiso, Florida; and Joseph Dongoski, Kearney, Nebraska. From out of country: Liya Zhu and Ji Feng, both from China; Abdullah Abdulkarim, Kuwait; Junying Tan, Malaysia; Hamza Ahmed, Pakistan; and Yousef Aldawood, Abdullah Alsulami and Hassan Al Thuwaini, all from Saudi Arabia.